When I was growing up, I dreamed of the day that I would be a career woman. I didn’t have any interest in homemaking. I told everyone that I would be rich and hire people to cook and clean for me. Ahh……the dreams of youth. Children were not in the cards for me. I would be too busy working and being fabulous. Then, my oldest son was born and I fell in love. He changed everything for me. Four children later, I still have a professional life, but now I can’t wait to get home to be with my family. I soon realized that I really should have paid more attention in my home ec class. I didn’t have a clue about cooking and preparing healthy meals for my family, so I turned to convenience foods and later to fast food. It wasn’t until my health took a turn for the worse, that I decided that I needed to learn more about real food. Eating real food on a regular basis takes time and effort. There is no getting around that fact. However, our lives are full of choices and requires that we set priorities. Once I made real food a priority, I set about setting up my real food kitchen. Having a good supply of quality real food ingredients on hand sure does make eating real food a lot easier. With my family’s busy schedule it is so important to always keep a well-stocked kitchen. Avoiding the temptation of fast and processed food is so much easier when I am prepared to make delicious meals. The last thing I want is the question, “What is for dinner?” to be asked and not have the answer. “What do you eat?” That is a common question. Seems silly that most of us really don’t know what real food is. Our food system is so messed up. We are supposed to be confused so that we will gladly eat chemicals. Real food simply put is ingredients and whole foods. 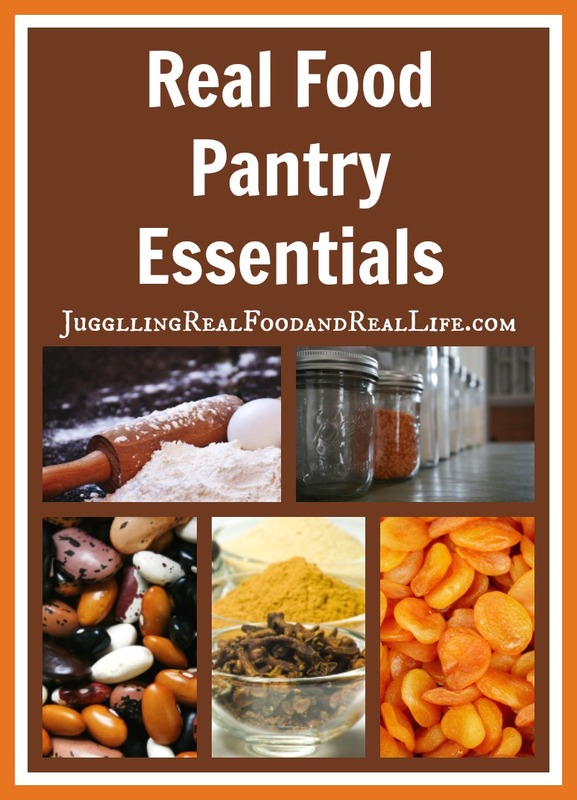 I put together a list of my real food pantry essentials to assist you in setting up your real food kitchen. You won’t find cream of something soup on this list, but I promise……….you will still have plenty to eat. I’m wanting this to be a resource for folks just starting on their real food journey. If you are more experienced at this real food thing, go ahead and leave me a comment with what you would add to this list. I’ll come back and keep updating this list as needed. I’ll be back soon with my refrigerator and freezer lists. For real food recipes check out my recipe index. I add new recipes all of the time so I hope that you check back often. If you are looking to plan your real food meals, you will want to check out the section of the blog that I have devoted to all things meal planning. It included advice, tips, and a free printable meal planning calendar. These are great tips. If you have all those on hand putting together a healthy meal or snack can be easy. I love to get involved in the kitchen and can spend all day there, but I really prefer simple ingredient recipes. Hello Christina, I always use simple ingredients to make recipes. These tips are very helpful for cooking healthy meal with simple recipes. Thanks for such an amazing tips.